Hurricane-like storms batter the landscape. Seasons last weeks at best. Strange polyps unfurl in the wake of extreme weather, and massive crustaceans can be as common as cattle or as devastating as a Typhoon. Uncounted millennia before, Orders of Knights Radiant warred with the mysterious Voidbringers for the salvation of mankind. But that was before they abandoned humanity, and now darkness returns to the storm-lashed world of Roshar. 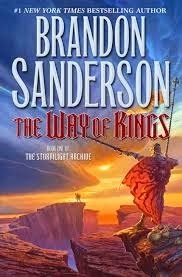 The Way of Kings is the first entry of ten in Brandon Sanderson’s Stormlight Archive and is massive in the way people think of continents as big. There are roughly three main storylines intercut with several secondary storylines and a few “interludes” between book sections. It may be useful for readers of Sanderson’s Mistborn Trilogy to know that The Way of Kings is about as long as Mistborn: The Final Empire and the first half or so of Mistborn: The Well of Ascension combined (That Mistborn is an epic fantasy itself should give some perspective on the size of this monster). The meat of the story follows Highprince Dalinar Kholin as he struggles to find a just path forward for his native country of Alethkar and Kaladin Stormblessed as he searches for meaning in the life of a slave soldier. This is not a work I would recommend for new or first-time fantasy readers. Its sheer size, scale, and alien-ness can be quite daunting. I would tentatively describe The Way of Kings as “Brandon Sanderson does Wheel of Time” if Brandon Sanderson hadn’t already literally written the last three Wheel of Time books. That description, however, should give a general idea of the sort of story being told here (and a warning to those unfamiliar with either name). The armies of Alethkar, led by their ten Highprinces and united under a young King, field elite warriors in armor powered by Stormlight, a mystical energy infused into precious gems by the storms that routinely ravage the continent. Additionally, some number of these warriors carry Shardblades, which slice all inorganic matter as if it were paper and, when used on flesh, paralyze and ultimately sever souls from bodies, though the flesh itself remains untouched. Additionally, Sanderson has cooked up several magic systems which all intersect with each other in novel ways. Much of the action of the book takes place on the Shattered Plains, which consist of dozens to hundreds of flat mesas split from one another by hundred-foot deep chasms. In order for medieval armies to do battle, slaves are employed to run bridges to each chasm, let their army pass over, and then race their army to the next chasm, all before repeating this struggle as the army returns to camp. Needless to say, the weak are quickly, and mercilessly, weeded out. The world of The Way of Kings features a number of other unusual societies, cultures, flora, fauna, and phenomena that are all worth mentioning, but since this review is already a decent size, you’ll have to make do with the tip of the iceberg I’ve described here. Overall, a worthy entry in the hallowed halls of book series described as a “Sequence”, “Cycle” or anything larger than “Trilogy”. Had I rated it while reading, I would have given it 3 stars out of 5 due to the sheer length alone, but since I’ve finished, I can gaze at it fondly with the rose-colored shades of hindsight and give it 4 stars out of 5; I fully plan on reading the sequel to this book when it is released. This entry was posted in Book Reviews, Fantasy and tagged Fantasy, Guest Review.